nNNPDF1.0 is a first determination of the nuclear parton distribution functions (nPDF) based on the NNPDF methodology. 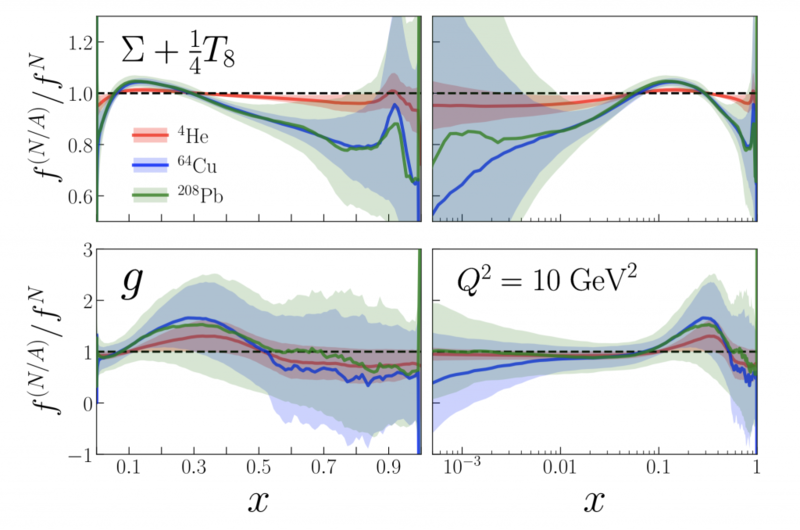 This analysis is based on neutral-current deep-inelastic structure function data and is performed up to NNLO in QCD calculations with heavy quark mass effects. For the first time in the NNPDF fits, the χ2 minimization is achieved using stochastic gradient descent with reverse-mode automatic differentiation (backpropagation). The nNNPDF1.0 distributions satisfy the boundary condition whereby the NNPDF3.1 proton PDF central values and uncertainties are reproduced at A = 1, which introduces important constraints particularly for low-A nuclei. We also investigate the information that would be provided by an Electron-Ion Collider (EIC), finding that EIC measurements would significantly constrain the nPDFs at small-x.